Lock up & walk over to the registration table. REGISTER! Grab some coffee and go to our sitting area near the registration table – read the Parent-Student Checklist found in your folder & sign the “Pledge”. Please READ ALL the forms & ASK QUESTIONS! Tom Simpson, VP & driving program manager, reviews the full-size map of the track, you’ll listen to guest speakers & listen to important facts about deadly driving habits and statistics among teen drivers. VOLUNTEERS are at ALL the practice stations on the track to answer your questions. You’ll be driving the track 1st, BEFORE your student drives, until you get familiar with the track. When you’re ready to switch, drive through the PIT area back to either the track entrance or breaking drill line. When you get back to either the SHERIFF at the entrance or the volunteer, you can change drivers. Have your student adjust their seat-back, steering wheel, & mirrors, locate the emergency hand brake, and blinkers, turn the headlights on, and please locate the hazard lights in case they’re needed. No texting while *driving or *riding… ALL EYES ON THE ROAD! This is a FREE event THANKS to your generous donations which help maintain folders, signage, portable restrooms & wash stations, and a BBQ hot dog lunch, chips, & drinks. VOLUNTEERS (students and parents) are always welcome! #1 Rule: NO PASSING (despite separate lanes)! #3 Rule: KEEP HEADLIGHTS ON! #4 Rule: PULL OVER WHEN STOPPING ON THE TRACK! FIRST, use your right blinker, THEN pull over to the right when it’s clear. Put your hazard lights on, AND STAY IN YOUR CAR! Leave your window slightly open to hear instructions. We’ll send someone out to you if necessary. SPEED LIMITS are are posted. Limits are 45mph as you approach the track entrance and on the opposite side. On the straight-away the speed limit is 35mph. THESE ARE LIMITS, NOT GOALS! Pay attention to SIRENS or FLASHING LIGHTS! 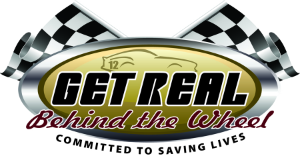 Slow down, put on your blinker & PULL OVER SLOWLY TO THE RIGHT (on the track) or at the FIRST SAFE LOCATION! If Officer Jim pulls YOU over, put your vehicle in PARK after stopping. If the officer is NOT PULLING YOU OVER, LET HIM PASS YOU SAFELY, then using your LEFT BLINKER resume driving in your lane. When practicing U-turns from the stop-sign, ONLY PROCEED when the center of the track is CLEAR and practice 3-point turns, braking, stop sign etiquette, etc. LOOK LEFT-RIGHT-LEFT at EVERY STOP SIGN (3-second rule). Avoid near-accidents by being very patient with other drivers. Report any problems and unsafe drivers!!! DO NOT GET OUT OF YOUR CAR ON THE TRACK (except if instructed)!